Many of us have done it at some point or another…given ourselves the “animal lover” title without any reason or substantiation. For years I was a self-proclaimed “animal lover”, forgetting the simple rule that “love” is not a noun but rather a verb that needs to be acted on. I was reminded of that important rule when I met Addie. Addie and her sister Aphie were born in an animal farm where animals were raised and sold for food purposes. The circumstances at that farm were horrific. Being raised simply for sale and consumption, Addie and the other animals at the farm were not expected to live long. Many were a product of inbreeding, which I would later learn from Addie’s own medical issues, has horrible health effects. My first reaction seeing the farm was to walk towards my car and demand my boyfriend drive away from that place immediately. But before I even closed the car door to leave, I realized I was doing it again…I was once again feeling sorry for animals I repeatedly claimed to love, but doing absolutely nothing to prove my love. Rescuing Addie and Aphie that day was the best decision I made. At our home (their new home) they swam in the pond daily and would go on mud-and-worm-finding missions throughout the yard, occasionally trespassing into the neighbor’s backyard where I had to go find them. One day we noticed Aphie fighting with the peacocks near the pond. Even though my brave little angel was outnumbered, she refused to back down. When I ran over to stop the fight I realized Aphie was trying to prevent the peacocks from getting too close to Addie. Addie was on the edge of the pond but couldn’t move much and wouldn’t come out. Once we were able to bring her out of the pond and take her to a waterfowl vet we found out her leg had become lame, a condition usually caused by a genetic disorder. For weeks she was on medications and sadly had to be placed in a coop away from her sister. Unfortunately, from that day on things didn’t get any easier for any of us. On the morning of Christmas Eve, I found Aphie dead in the backyard; a raccoon had attacked her. Although the pond was their safe area from predators, Aphie couldn’t stand being away from her sister. Being out of the water in the dark to go visit Addie’s coop made her an easy target for raccoons. The image and sadness that ran through my body the morning I found her still haunt me. However, nothing hurts as much as knowing Addie witnessed her best friend die just a few feet away. Over the next year we visited the vet monthly, and underwent several medical treatments. After numerous medications and long hours of pool therapy, Addie’s condition started to improve. While she was left with a slight limp, her determination and appreciation of life is admirable. 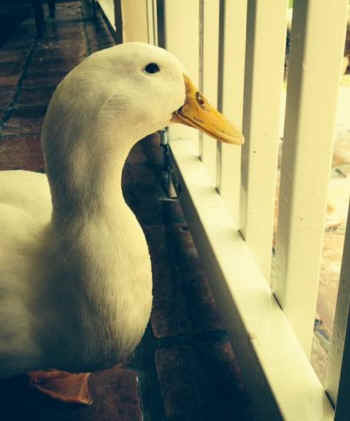 Her life, her struggles, and her losses have been my inspiration to be a voice for all ducks. As a law school student I was fortunate to take an animal law seminar course. The assignment in the class was to write a paper on a specific animal and how different regulations or statutes affect his life. Because the killing of animals for senseless reasons is not only increasing but is being glorified by television and businesses, I decided to focus on the biggest problem affecting ducks…hunting. I found that the whole idea of survival and fair pursuit was lost centuries ago and that now hunting has turned into a hobby. The sad realization is that in the end some form of horrendous demise plagues even ducks out in the wild who are free from farm confinements. Sadly, the concept of freedom for ducks is only illusory. 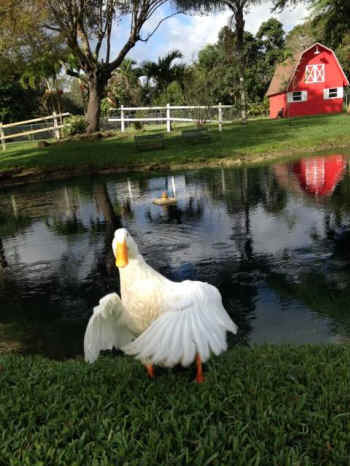 I pray Addie has forgotten about the nightmare she endured in that duck farm. I am also thankful that she is unaware of the tragic life a duck may encounter even out in the wild. I will continue to spread the word about the beauty of a duck’s life and work to push for better laws to protect them.